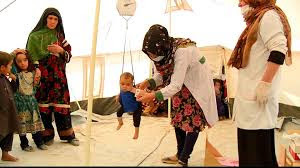 In Afghanistan, more than 40 percent of children under the age of five have stunted growth through lack of food and poor nutrition and 10 percent are wasting away to skin and bones. The number of severely malnourished children in Afghanistan is on the rise. Aid organisations warn it could reach two million. Countries are sending in food, but that is only half the battle. Often armed groups prevent the food from being delivered to those in need and aid workers have been attacked and killed. Al Jazeera's Tony Birtley reports from Herat.